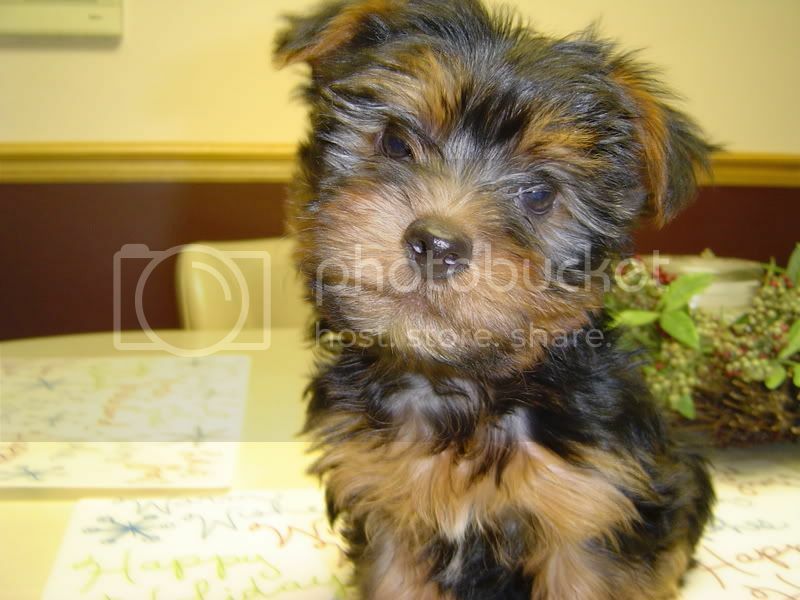 Age of Yorkie(s): 10 wks. Weight of Yorkie(s) parents:AUGGIE IS 4.6 lbs. and JAZI IS 6.2 lbs. 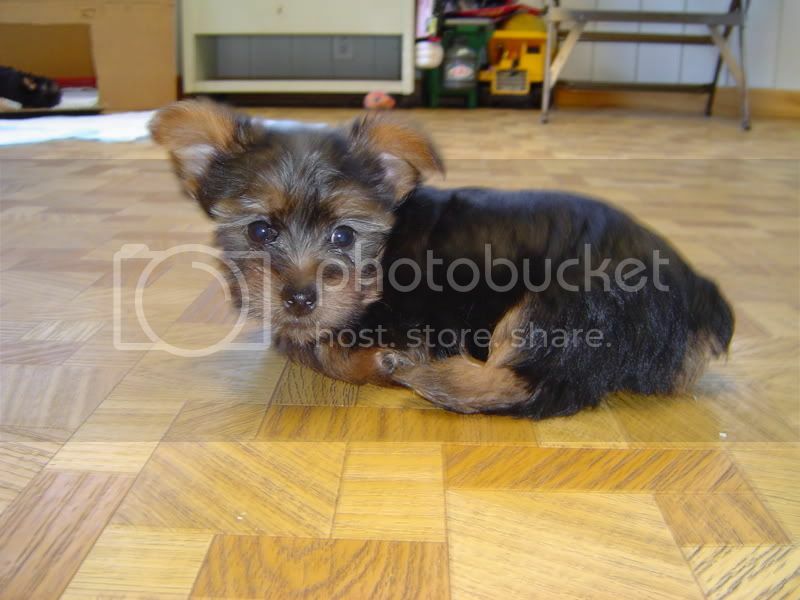 Current weight of Yorkie(s) for sale: 2 lbs. Registration if any (AKC, etc): A.P.R.I. Age when puppies will be ready to be taken home: A.S.A.P.! I NEVER HAVE & PREFER NOT TO, UNLESS BUYER HAS A GREAT DEAL OF EXPERIENCE IN DOING SO ! Aww this is EXACTLY what I am looking for to COMPLETE MY FAMILY 2 more yorkies a boy and a girl WHY you have to be so far Good luck in finding a good home! I wish you were closer also, you would Love my little furbabies. I will post some pics tomorrow if I can figure out how to resize them, so bare with me. HERE ARE A FEW PICS OF MY FURBABIES THAT I CALL TUCKER & TINKERBELLE. I HAVE TO CALL THEM SOMETHING OTHER THAN PUPPY 1 & PUPPY 2, RIGHT? YOU CAN NAME THEM WHATEVER YOU LIKE IF YOU ARE THEIR NEW FAMILY. THE WORST THING ABOUT GIVING THEM NAMES IS IT SEEMS TO MAKE IT HARDER TO LET GO OF THEM WHEN THE TIME COMES, DON'T YOU AGREE? ARE'NT THEY ADORABLE THOUGH ? TUCKER IS THE ONE WITH EARS DOWN A LITTLE & TINK IS A BIT SMALLER WITH EARS STRAIGHT UP NOW. My husband and I have been looking for 2 Yorkies. We want a boy and a girl so this is perfect. What is your price for the both of them? OH YOU ARE HEAVEN SENT! That would be so great if they could stay together. I will P.M. you my information. They are to cute! Ifalcone, here's hoping you all can work something out and get both the puppies. 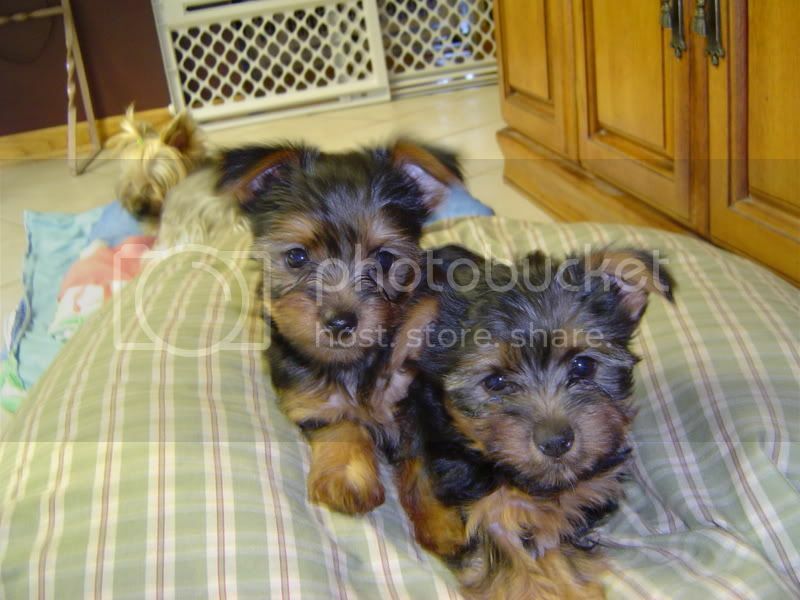 I'm In Love With 2 Yorkies! Just arrived home with your two puppies.... they are SO ADORABLE! We have decided to name them Daisey and Duke. They are exploring EVERYTHING... and showing us all of the things that we need to clean and pick up They seem to be adapting to their new surroundings quite well. Duke (formerly known as Tucker) whined a good number of times on the way home... missing his mommy and daddy. We really love'em, and have lightened our little apartment so much... and they have only been here for 30 minutes. We are getting a new camera tomorrow, and promise to take lots of pictures. Wow, congratulations! Please post pictures asap, they are together and that's wonderful. congrats to you.what a lovely news.. I'm so happy you and Jaimi are happy and made it home safely with the babies. You two are a very sweet couple and real troopers, I must say. These little imps will never take the place of Lacey but they will definitely ease the pain with all of their Love. Duke (cute) is a definite cuddler/hugger like his Mommy. Daisey (too cute) is more aloof but likes to give kisses.Oh! I just got the Daisey-Duke Thing, I like it! (Hey, I'm Blonde what can I say). They will also keep you very busy and that may help as well. You are right about them finding every little thing everywhere. They definitely keep you on your toes with the housekeeping. That's part of the reason I have gates everywhere. Also the fact that they're still in training with the piddle pads. Jazzi is a bit confused about her kids being gone. This being her first litter and all, but Roxy seemed to sense it and actually let her get a bit closer to her newborns. I hope all goes well with your move to South Carolina, and your little family lives "Happily Ever After" with your watching over you. Lacey want's you both Happy and she knows you Loved her with all your Heart's during her short stay on Earth, and did everything you could. That's all any of us can do. I also believe she hand picked my little babies just for you. Last edited by Key2Yorkies; 01-03-2007 at 07:57 AM. Awww Shucks... We hope their Mommy and Daddy will feel better about their lose soon. OOHPS! I meant North Carolina. Don't Worry Dad could care less and Mom will be fine in a day or two. The first and third picture are Duke, the second picture is Daisy, and the other picture is my wonderful, beautiful wife Jaimi holding our pooches. your new babies are gorgeous!!!!!! !